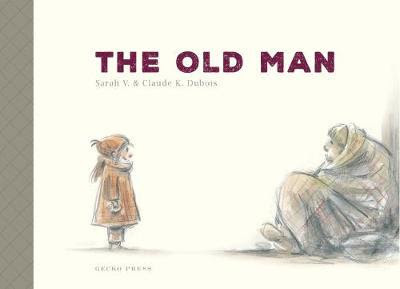 The Old Man by Sarah V and Claude K Dubois is a moving story that will invoke discussions about compassion and justice. A town wakes to a new morning. A little girl goes to school while an old man walks along the city street, trying to warm up after a freezing night. He's really hungry and tired. The old man finds a spot in the park to sleep and people pass him by, not noticing him. The police wake the old man telling him to find somewhere else to sleep. He goes to a shelter but is turned away because he does not remember his name. What will he do? The story continues to follow the old man through his day. By the end of the story, readers receive the promise of hope when the old man is noticed by a little girl, who gives him an unexpected gift. Sarah V has written the kind of story that is both dark and light. The Old Man holds up a mirror to our society which may make this book confronting to adults but it is an important story to share with your children. Both the text and illustrations in The Old Man helps readers examine their own conscience. Are you the person who never makes eye contact with homeless people or are you like the little girl who only sees a lonely person wrapped up in a blanket. The Illustrator Dubois's pallet is soft and sombre with a sketchy drawing style using watercolour pencils. He sets the scene in The Old Man in a masterful way, making readers feel the dankness of the cold daylight in a cityscape, creating a feeling of hopelessness. The inclusion of pops of soft red of the little girl's coat and hat creates warmth and a the possibility of hope. The Old Man reminds adults that children are pure of heart and they have no prejudices towards other people until they are taught it.